The target of research is to produce several authoring tools for all kinds of content like music, video and music video. “LyricsRadar” is a visual music navigation system by a query of lyrics semantics to search the most favorite song very quickly by mouth operation on the lyrics radar chart. 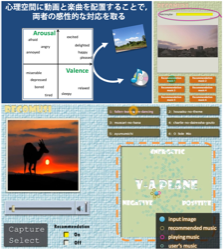 “RecoMusi” is a music recommendation system considering an atmosphere included in an input image. “Query by Phrase” is a music retrieval system based on a query of short melody played by any instrument without any musical score. An automatic video summarizing system of racket sports can produce a very short movie (10 minutes) from a long (a couple of hours) on-air sports content by an automatic priority criteria of human interest. Human retrieval system is proposed to search an impressive photo from huge database on the Web based on the impression of hair color, style and direction. Music video viewing system is proposed to pick-up video shots which include a favorite artist face or singing voice. As an authoring system, “VRMixer” is produced in which the boundary between real world and virtual world is eliminated to share the common space and play together at the same time with people located remotely. Automatic synchronization system between music climax and video climax is proposed by controlling the length of music adaptively. 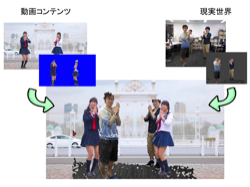 “DanceReProducer(DRP)” is a typical authoring system which can produce an appropriate movie automatically synchronizing with the input music by rearrangement of copy and paste of existing video segment on the Web. This project is supported by JST OngaCREST project. Each point on the space is corresponding to a music piece and then music with closer impression are located closer on the space. 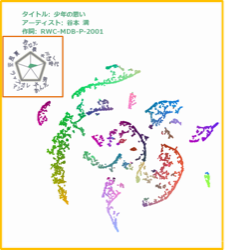 When mouth-over a point in the space, semantic and music information are displayed in a radar chart with real-time.